HAPPY HALLOWEEN EVERYONE! I hope everyone is having the spookiest Halloween EVER. I LOVE Halloween and I know we are making the most of it! I got to help out with the class parties today and we had lots of fun at the two parades. The morning kindergarteners got to do a parade just by themlselves. They get to go and parade through all the class rooms they were so proud. Josey even got some candy in some of the classrooms so pf course that was her best part. She heard on the news today that chocolate is better on a kids teeth than chewy candy. What she heard though was that choclolate wasn't that bad so now she is obsessed with telling me that chocolate isn't that bad for her so she should be able to eat more of it. When we went to Maddy's party in the afternoon she got to go through the parade again. She did not want to walk with Maddy though she really wanted to walk with this random boy in Maddy's class. She is so wierd sometimes. Watching the kids do the limbo was the funniest. They are so cute. The party was so fun for the kids. They came in from recess and were so surprised and excited to see the decorations and all the treats on their tables! They played pin the nose on the pumpkin and limbo. Here are the two witches in the class. Maddy and Mrs. Conney-Mesker What cute little twiches (twin witches if you were confused). They had quite the Halloween party. Seriously I was a little amazed at all the decorations and food and games that were planned. The kids loved it of course. I thought it was fun to see some of the costumes that the kids at school decided to be and I wanted to share my favorites. I know this isn't a good picture but it made me laugh. That kid in the front of the line there had a deflated kickball on his head with eyes cut out. Maybe it is just me but it was really funny. I likes these costumes but the funniest part is that they are boys in our ward. I was sitting with one of the moms as they went by. As her son KC came walking up she said, "I honestly didn't know he brought a cigar." I thought it was pretty funny that the mormon boys were the only ones "smoking"! I heard his sister say as they passed each other, "KC I like your cigarette." Too funny. I guess this never gets old for me. This kid looked great. I loved his liger necklace. That kid walked through the whole parade as an orange cone! I have no idea how he got that costume to school. This is the winner! This one was the funniest and is dedicated especially to Rob and Andrea who live in Reno. For those of you who never watch comedy central it is a character from Reno 911. I will refrain from printing his name. I thought it was really funny but a little disturbing that he watched that show. I was tagged by Alissa to give three recipes, so here goes. I am really not a great cook but these recipes are ones that I know work and taste YUMMY! Sweet and Sour Meatballs (wedding meatballs)-All of my sisters and pretty much all of my moms friends children have had these at their weddings. I make them occasionally for my family at home because they are just really good. Make sauce by heating till thick (dissolving cornstarch with a little cold liquid and adding before mixture gets too hot). Taco Soup-This one is REALLY REALLY easy and a recipe that I got from a friend Gretchen many years ago but my family STILL loves it. Add it all together and there you go. I told you it was easy. We usually put chips at the bottom of our bowls, then load up the soup and top with sour cream, avocado and cheese. Chinese Chicken Salad -This is my moms recipe and it is a little involved but well worth it! SO YUMMY! Hope I helped somebody with a dinner in the future. I know I will be taking the recipes off of everyone elses blog and throwing it into the mix of my dinner group......have I told you all how AWESOME that is by the way? Well we decided to carve our pumpkins last night. I actually love carving pumpkins. I think it is really fun and I always look forward to doing it every year. But with the amount of pumpkin patches we went to this year, and the amount of children we have, we had a lot of pumpkins to carve, as you can tell from the first picture there! Or I should say I had a lot of pumpkins to carve. Dustin HATES carving pumpkins. He HATES cleaning them out. He HATES the smell and he NEVER wants to carve them. So it falls to me to make our pumpkins into scary jack-o-lantens. 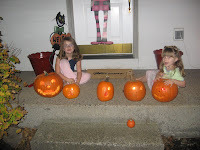 I made the girls clean out their own pumpkins and I told them that who ever could get their pumpkin cleaned out first would get to carve it first. Can you tell who won? Josey had NO problem. Maddy on the other hand....well just look at her face. I ended up cleaning it out. Lilly stayed put on her nice comfy daddy chair. Dustin's whole look here pretty much defines his feelings towards carving pumpkins. And you can see our finished jack-o-lanterns just waiting to spook all the trick-or-treaters. The girls are so excited for Halloween. 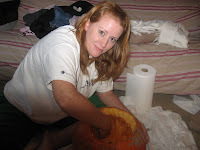 I have to add that if you haven't carved your pumpkins yet go to the store and get this little pumpkin carving tool. It is AMAZING! And actually quite fun! It is this little electric saw thing that makes carving pumpkin SOOOOOOOO much easier. My hand wasn't sore and I carved FIVE pumpkins. I will never carve without it. GO GET IT! Grandma Beth sent us a Halloween package complete with cupcake mix and decorations. 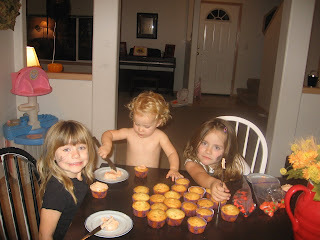 The girls had such a fun time decorating them and eating them....especially Lilly. We jsut wich you could have been here with us to do it. Thanks Grandma Beth! She was happy in this picture oddly enough. She LOVED frosting her own cupcakes. She finally got the hang of putting the little sprinkles and m&m's on by shoving them into the cupcakes. She would then proceed to pluck them out and eat them. She was more interested in eating the candy than making her cupcakes look pretty! We had these little candy pumpkins to put on the cupcakes but Lilly refused to eat them. She just kept giving them hugs and here she is giving it a kiss. This was the only picture I got of the girls at the zoo event Howl-oween. How do you go to the zoo and not see ANY animals? You have one hour left until the trick-or-treat scavenger hunt ends and you have two girls that are very concerned that they aren't going to get the prized goodie bag at the end. You also forget a stroller and have an 18 month old who has different ideas of what direction you should be heading in. I can't say it was fun racing around the zoo trying to get our paper stamped just to race back up to the front to get some candy and a coloring book but oh well. lost tooth and a GOOOAAAALLLL!!! Well I don't have any pictures this time but the title of this post has been used before. I don't know what the deal is with Maddy losing teeth and Josey scoring goals in the same weekend. Maddy has lost yet another tooth. I seriously don't know how she eats. She has another loose tooth as well. She has almost no teeth in the front, it is crazy! The tooth fairy is going broke! And Josey had a miraculous soccer game today. Next game I am going to bring my camera. I don't know what happened but something clicked for her a couple of weeks ago when she scored that first goal. We missed last Saturdays game due to the primary program practice and so this was the next game for her. She scored THREE goals in the game! Dustin and I couldn't believe it. She was good! We were shocked! She was dribbling the ball in and out of the other players and taking it to the goal. She has always been very aggressive out there which is a plus in soccer but she finally got it that if she kept it close to her and followed it she could probably keep it. Seriously the other kids would almost just watch her kick it down the field and score goals! After every goal she would come and give me a high five and then ask if she could stop playing now. I kept saying just a few more minutes, see if you can do it again, and begrudgingly she would go back in and score another goal. When it was time to switch up the players it almost made me sad because it was so fun for Dustin and me to watch! It is funny how you never know which child of yours is going to succeed at certain things. Maddy thinks she is a soccer expert and is always telling Josey that she will coach her on how to do things, which is really cut to watch BUT Maddy was not very good at soccer. Dustin and I would joke that she would just orbit the ball and stay the same distance from it at all times. I think in the three seasons she played she touched the ball five times. It was fun for her and for us to watch still but it just wasn't her thing right now. Josey on the other hand just gets right in there and has no fear with the bigger boys (cause let's face it everyone is pretty much bigger than Josey) and takes that ball away. She just gets it apparently. Anyway she still doesn't want to play anymore so oh well! Maybe when she is older? It is wierd how our children come with these different talents and dispositions. Maddy has an inflated self esteem issue. She thinks that she is the best at every single thing in the world. Even things that she has never done before. She actually threatened some boys that were teasing Josey once with her karate skills. SHE HAS NO KARATE SKILLS! She was seriously offended when they laughed at her and she couldn't figure out why. She thought that she could take on this entire team of older hispanic boys soccer team once. She kept saying that she was better than them. The thing is she believes it! It is not just some trash talk or defense mechanism. She really believes it. Josey on the other hand is just proud of her golden hair as she calls it and is proud to be the littlest one in her class. She loves being little. Now she actually has something that she could legitimately be proud of with the soccer today and she didn't want to talk about it the rest of the day and refused to call anyone to tell them about it. I don't get it. Alli made this and I thought it was funny so I copied it. Sorry Alli or thank you. I just think it is funny because I have seen Dustin dance like this just maybe not in that exact dress. Ryan on the other hand, not so much. And I love seeing him jump up in the air like that. I stole this one as well. We had a break through today and I am very very excited about it. Joselyn had to get more immunizations today, poor girl. We went in before school started to get their kindergarten shots but apparently there were a couple that she was missing so I had to take her back in today to get more shots. The first time we got the shots it was TORTURE for both of us. I actually cried and I haven't done that with my kids getting shots in a long time. So I was very wary to bring her back in. I think I was dreading it as much as she was. So today was the day. When we got in the doctors office I told her that we did in fact have to get a couple more shots and she FREAKED OUT! She resembled a wild animal at one point trying to climb under the table in the room. She was screaming like someone was trying murder her and she was terrified and the nurse and doctor were not even in the room yet. Needless to say I was expecting to have to call in a few other nurses to hold her down. I sent Maddy and Lilly out of the room when the nurse finally came in to administer the shots because Josey was really scaring Lilly. So she kept freaking out, crying, screaming, the whole thing. The nurse and I are trying to reason with her and talk to her and calm her down. I had promised her a big slurpee after the shots if she would be brave. So I said to her, "Remember last time when we got shots. It was over SUPER fast and it only hurt a little bit. And you don't want to miss out on that yummy slurpee do you?" She stopped crying and looked at me and said, "okay....I'll do it" in like the saddest most defeatest tone ever. But she completely stopped crying and got the shots and did not cry or scream or move a muscle through three shots. She just talked to me and the nurse while she was poking her. Now I have always known that Joselyn is a little bit of a head case but I was shocked. I was excited that she is finally to a point that she is able to reason through some hard decisions. I guess if she decides something that is just the way it is for her. It is good to know in the future. 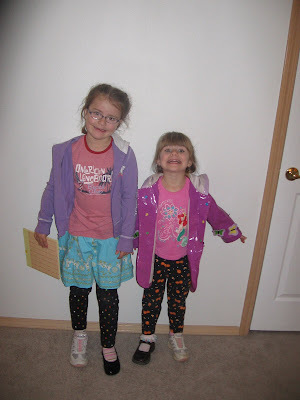 It is spirit week this week and today the girls were supposed to wear mismatched clothing. SO this is what we put together. They were SO happy and excited because this is what they would normally pick out anyway! I think Joselyn wore an outfit similar to this to a pumpkin patch recently. They thought it would be so funny to wear mismatched shoes. I just hope that everyone else dresses up and they don't get teased today, because as they headed out to the bus stop one little girl was like, "MADDY! Why are you wearing two different shoes??!" They will either be the coolest mismatched kids in the school or they will never want to go back. For FHE this week we went to the fan night for the Trailblazers. It was free. So the girls and I met Dustin downtown and made our way over the stadium. Unfortunately we missed all the pre-game stuff but oh well. It was still fun. I don't know why my girls have their fingers up in this picture. Apparently Joselyn is number one and Maddy is number two or she wants peace. I have no idea why there was a big pencil there but Josey wanted a picture with it. Neither Maddy nor Lilly would go near it. Here is Dustin trying to get his girls to be sports fans with him. The funniest part is that when the cheerleader/dancers came out is when the girls really perked up! After it was over they said that was their favorite part. Poor daddy....actually maybe that was Dustin's favorite part too. just kidding. I have to say though that when the dancers came out I almost took my girls out to the hallways. They were dressed SOOOO risque. They basically had on bikinis and go go boots. And at first they started dancing to "Don't you wish your girlfriend was hot like me". Not exactly the song I would like my kids to hear and know. It is just so frustrating to try and explain to them why those girls are wearing such immodest clothing and dancing the way they were. I can't explain it because there really is no excuse for it. And on a side note they STANK! Maybe they were hoping that everyone would be distracted by the outfits and not notice the fact that like half of them couldn't really dance? This is how cheap we are. When we were leaving they were handing out coupons for free Chalupas from Taco Bell. I happen to pass the lady that was handing them out and I showed it to Dustin. He actually braved pushing his way back into the moving crowd with the girls (so they could each get a coupon) just to get some free Chalupas. What's wrong with us? Joselyn had her first field trip today! And where do you think she went? A pumpkin patch of course! I was able to go with her just me and her and we had a great time. We got to have a hay ride, eat pumpkin doughnuts and apple cider, look at all the animals, learn all about different kinds of pumpkins and pick our own pumpkin. It was so nice to get some alone time with Joselyn because it so rarely happens anymore. This is Josey picking out her pumpkin. You have to blow up the picture and check out her face. She was having the hardest time choosing one. Josey wanted a picture with all the lilly pads in the pond. This is Josey drinking her apple cider. I had to give her mine as well she loved it so much! This is Josey's friend Julia in her class. Does anyone else think she looks like someone? I think she looks like Maddy a little bit. This is Josey and Ben, the little love birds! They are so funny and his mom and I were just laughing the whole time watching them. These are some of the girls FAVORITE things to do with daddy, flips and superman.